The Tuesday incident on Skillin Street is under investigation, the city manager says. The city of South Portland said it will conduct an internal investigation to determine how firefighters damaged a brand-new $1.1 million ladder truck on Tuesday during a training exercise. The city said three firefighters were training in the rear parking lot of the Cash Corner fire station when the truck’s aerial ladder made contact with power lines along Skillin Street, damaging portions of the truck’s electrical system, the city said in a written statement. The surge of electricity also caused the truck’s front right tire to catch fire. The three firefighters who were training with the truck safely escaped the vehicle and extinguished the flames. Central Maine Power shut down electricity to Skillin Street so fire crews could remove the truck. 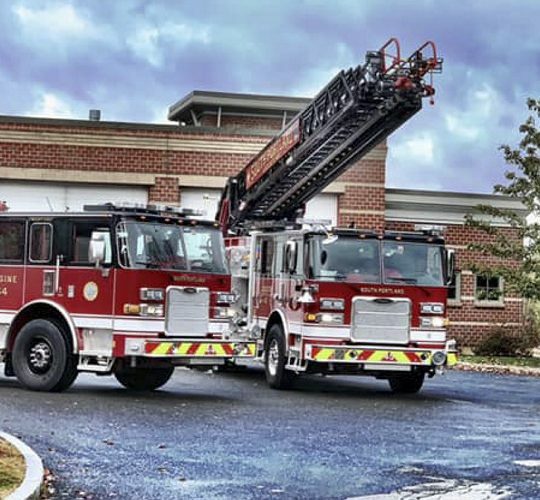 Support staff from the truck’s manufacturer, Pierce Manufacturing of Appleton, Wisconsin, helped firefighters use manual override systems on the truck to lower the ladder so the truck could be stored in an empty bay at the fire station. Capt. Robb Couture, spokesman for the South Portland Fire Department, said that representatives from Pierce Manufacturing as well as insurance adjusters are scheduled to assess damage to the truck Friday before coming up with an estimate for repairing it. Couture said the fire department does not know how long the truck will be out of service. In the meantime, the city will deploy its 1996 ladder truck. Couture said the 1996 truck is in good working condition and will be based at the Cash Corner fire station. “The city is conducting an internal investigation as to how this incident happened, what steps need to be taken to prevent it from happening again, and any other actions that may need to be taken due to the seriousness of this event,” South Portland City Manager Scott Morelli said in a statement.